At least I hope it is! I am done with all the rainy, cold weather... with or without cute wellies! I've got visions of sunshine and beach towels and tall cold lemonades dancing in my head. Here is one of my all-time favorite summer things! The Wonder Wheeler Deluxe! Looooove it! What a fabulous invention. We bring it to the pool every day during the summer, heck, this baby made it possible to go to the pool the last few summers. Without it (perish the thought) trips to the pool were pure mother torture. 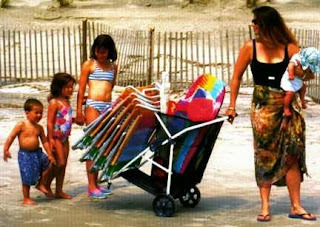 Load it up with the cooler, the folding chairs, the picnic blankets, kids jackets and toys, you name it... it can take it. It really hauls piles of stuff! It's got huge back wheels and can roll over rough terrain with ease. 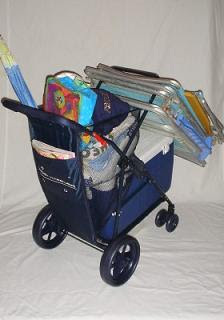 It can be pushed with one hand while toting a toddler or more bags with the other. The kids can push it easily (as long as they're tall enough to see over the top of it). 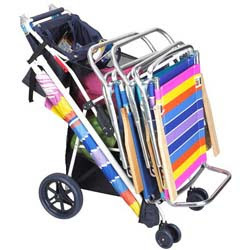 It folds up flat so you can keep it in the back of the car. Wherever we go with it lots of people ask where to get one. You can get it here for only $49.95 (oooh and free shipping). I think I paid about $80 for mine a few years ago and it was worth every penny plus! The latest one also has a detachable tote and umbrella holder that mine doesn't... bonus. Check out this mom, see what I'm saying?! This is actually a picture of an older model. The newer ones have wheels on the front and back but it is a good illustration of what you can do with it. Here's another shot of an older one but it shows how a cooler packs on it. Five stars from me!! Someone's thinking that is a long over-due invention! Thanks for posting that!